The 2011 Stanley Cup run of the Vancouver Canucks was filled with big plays and emotional moments. In the middle of many of these memories was left winger Alexandre Burrows. Originally un-drafted, he was signed by Vancouver as a free agent after working his way up through the ranks. Burrows has emerged as a clutch sniper for the team. He broke out in 2008-09 scoring 28 goals. He notched another 35 in 2009-10. 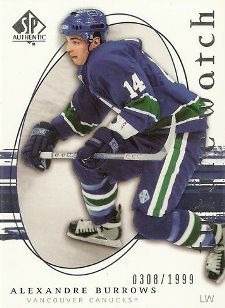 Burrows' total dropped to 26 goals in 2010-11, however he did miss ten games. The drop in production was forgotten come playoff time. Burrows scored the overtime winner against Chicago in the seventh game of the first round. Eleven seconds into game two of the Stanley Cup Finals, the Pincourt, Quebec-native netted the puck on a wrap around to give the Canucks a hard-fought victory. 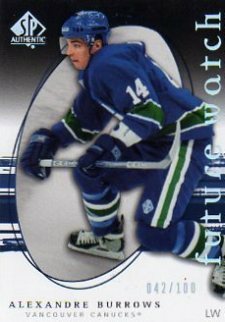 Burrows has relatively few rookie cards. 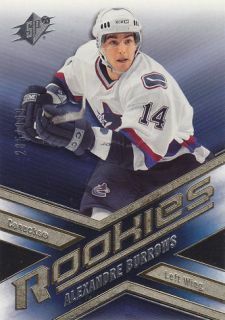 Released in 2005-06 sets when Upper Deck held exclusive NHL hockey card rights, all of Burrows' rookies are serial numbered. None, however, carry autographs or jersey swatches. His rarest rookie card is from SPx, limited to 999 copies. None of Burrows' rookies cost big money, even the somewhat limited parallels. It should be noted that one-of-one printing plates of the forward's rookie cards were inserted in 2005-06 Upper Deck The Cup, although he was shutout from the basic checklist. 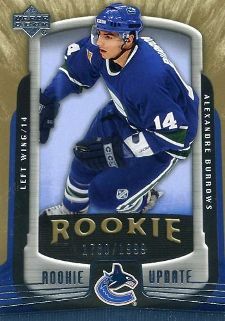 If he continues to score often and score big, more and more demand will follow early Alexandre Burrows hockey cards such as his rookies highlighted below. Hot Prospects isn't exactly an iconic brand in hockey cards. As far as card designs go, it is equally forgettable. Cast against a drab grey backdrop, the Burrows represents some of the only color on the front of the card. Next to Upper Deck's "Young Guns," SP Authentic's "Future Watch" cards are probably the second most popular rookie subset in that part of the hobby. However, part of what makes the brand so popular is the fact that many of the top players provided autographs for the set. In 2005-06 Burrows wasn't considered a star, especially when placed alongside other first-year superstars Sidney Crosby and Alex Ovechkin. 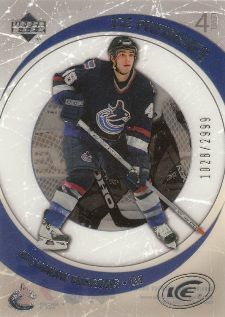 The rarest Burrows rookie, his SPx card is limited to 999 copies. It's fairly tough to come by and commands about the same as his SP Authentic rookie. The card design has lots of color, however it's extremely busy. The X-inspired nameplate gets almost as much space as Burrows' picture. 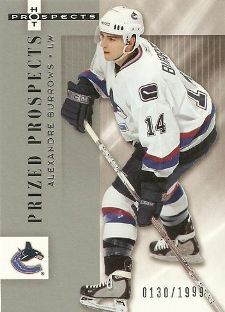 Although it's his most plentiful rookie, Burrows' Upper Deck Ice card is also his nicest. Printed on acetate, the card has a cool, see-through appearance to it. Another set likely brought on by the Crosby- and Ovechkin-led rookie mania, the 2005-06 Upper Deck Rookie Update set is largely forgettable outside of the major stars. That being said, this is one of the more classy designs from the year.